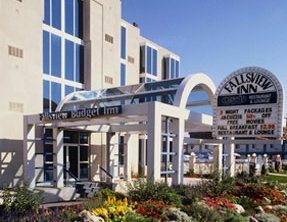 The Fallsview Inn, is conveniently situated in picturesque Niagara Falls Canada only 2 blocks from Niagara Falls and close to all major Niagara Falls attractions. The Fallsview Inn and its staff are dedicated to ensuring that your stay with us is both a comfortable and memorable one. The Fallsview Inn is located in the beautiful fallsview district. Our five story hotel offers a variety of rooms and services to suit all your vacation needs, including standard king and queen rooms, spacious family rooms, as well as romantic jacuzzi rooms. Also located in the hotel is an indoor pool, hot tub, sauna, exercise area, free on-site parking, Restaurant and Lounge, and free wireless access in the common area’s of the hotel. We have games for youngsters and the young at heart, a spacious heated indoor pool with adjoining sauna, plus an on premises restaurant, complete with fully licensed bar. And when it’s time for sightseeing, just ask the staff about the tours we offer.